Here we are on the edge of Dedham Vale, one of Suffolk's most famous tourist areas; but Great Wenham shares with nearby East Bergholt a sense that it is a proper working village. Part of this comes from the proximity to the church of council houses, homes to the descendants of the countryside's ploughmen, blacksmiths and farriers. That they probably all work in shops and offices in Colchester or Ipswich these days doesn't matter - this isn't a retirement village, and village life thrives because of this. Unfortunately, this vibrancy is rarely reflected in the size of parish church congregations, but at least the communities are still with us. This church isn't far from its sister at Little Wenham, and externally has some similarities; but inside, the contrast couldn't be greater. There, an extraordinary medieval survival sits among fields. Here, the Victorians went to work, and made a good job of it, mostly. 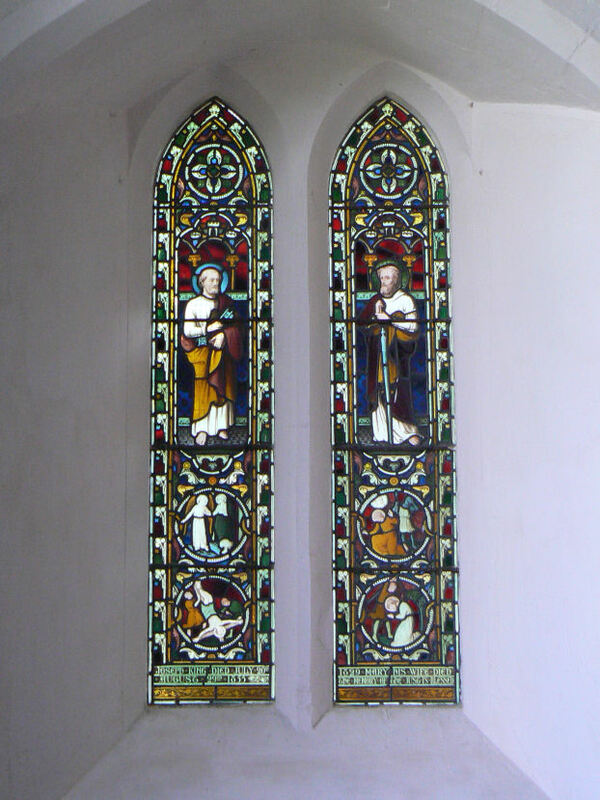 There is none of the high-pitched melodrama that has dated so badly at neighbouring Higham; this was a low-church parish, and the white walls, clear glass and evangelical inscriptions are the sort of thing that many people like nowadays. The interior here could be described as tastefully discreet. Most successful, for me, is the superb west end. The organ fits snugly into the tower archway, and wooden panelling below it finishes it off neatly, as if it was a rural version of a great 19th century concert hall. You can easily imagine an oratorio performed here. Small-scale secular grandeur at its best: Praise God in his Sanctuary it says above, and most Victorians would have put this quotation from the 150th psalm at the other end of the church, of course. At the east end, above the rational light of the chancel window, we read Holy Holy Holy Lord God Almighty. 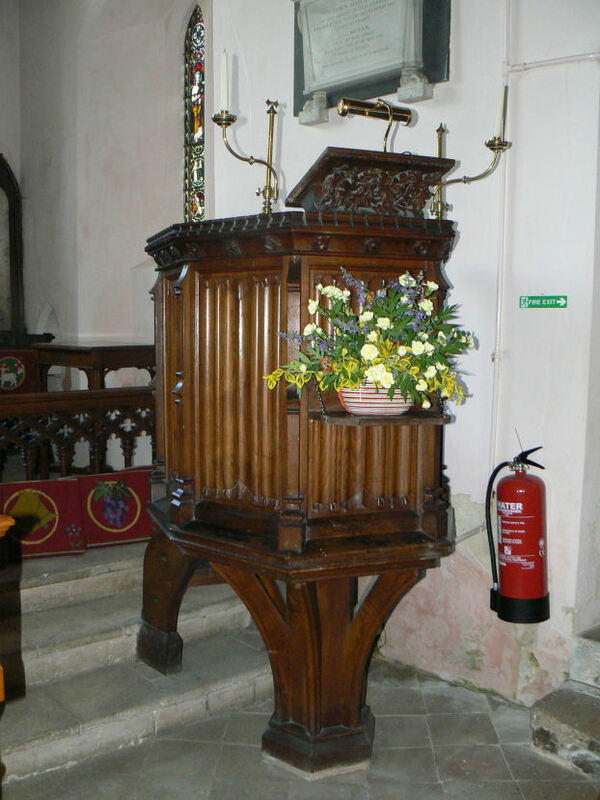 Victorian woodwork abounds; and the font was also replaced, in common with those in several other churches around here. The Victorians enthusiastically rolled up the sleeve on the muscular arm of their Christianity here, and it's all good stuff; but you have to step outside to remind yourself that you are actually inside a medieval building, and not some mid-19th century chapel. There's nothing surviving from Catholic England to be seen inside. Or, almost nothing. For up in the sanctuary are some medieval tiles, rare enough in Suffolk, and almost certainly reset here from elsewhere. But then, the parishioners here have a long history of protestant simplicity; when William Dowsing came this way on the morning of February 3rd, 1644, he found nothing to offend his puritan sensibility. 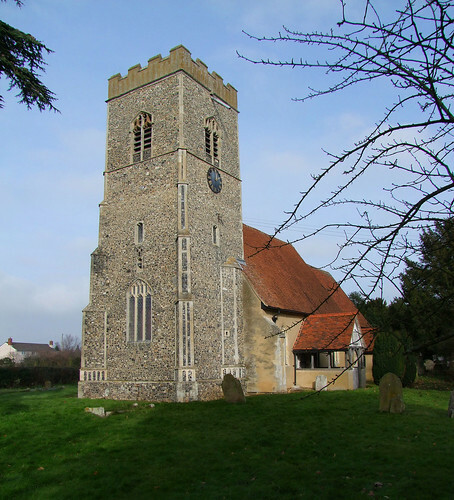 Probably, the parish was under the influence of the Vicar of East Bergholt, who was so famously an enthusiastic cleanser of idolatrous imagery from his own church that, despite living only a couple of miles away, Dowsing saw no reason to visit it. A 17th century curiosity is set high up in the north wall. A modern wooden plaque bears a helmet, crest and sword. Probably, the helmet once hung above a memorial. Mortlock thought that they belonged to the East family, who were local puritan land-owners at the time. 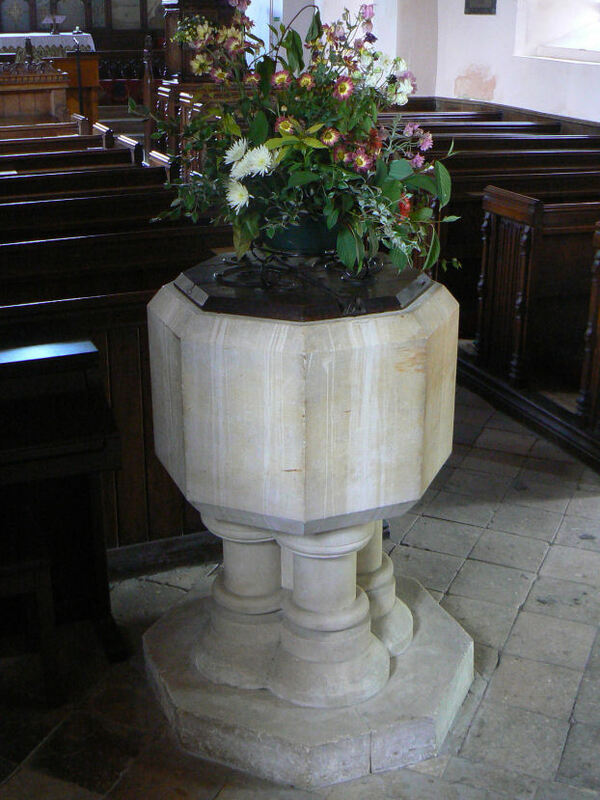 When I visited this church on the day of the 2002 Suffolk Historic Churches Bike Ride, I found a vast array of specially baked cakes set out to welcome visitors - indeed, this was one of the most hospitable churches of the fifty or so I visited that day. I'm afraid that this is no longer the case, for this is one of the very few churches in this area of south Suffolk and north Essex which is now kept locked without a keyholder notice. I discovered this when I skidded to a halt on my bike outside the churchyard gate on one of those freezing, gloomy days in February 2013. As I pushed the gate open, a huge Jag pulled up behind me, and an extremely posh old lady wound down her window. "Can I help you?" she intoned, in a cut glass accent. Unfortunately, thanks to the cold I was trying to shake off, it took me three attempts to work out what she was saying. Perhaps the catarrh contributed to my obtuseness, because I could only think to reply "In what sense?" However, she was nothing if not patient with me. "I can see that you are going up to the church," she persisted. "Why?" Ah! "Yes, I'm hoping to find it open," I said, with perhaps a hint of pleading. But it was wishful thinking. She looked at me sternly. "Well, it's not," she told me. Ah. I asked her if she had any idea where I might find a key. She told me that the lady at the council house on the corner had one, and she was working in her garden. I thanked her, and she drove off. I went up to the church to photograph the exterior, and after a few minutes caught sight of her again, parked on the other side of the churchyard, watching me. But by the time I went for the key, she'd gone. Well, I couldn't work out which house she meant, and no one was working in a garden. There was nothing to be done. So, shaking the dust of Great Wenham from my feet, or at least the mud from my tyres, I headed on the short distance to Little Wenham. Peter Stephens' photographs of the interior, taken in 2011 when he was lucky enough to find someone cleaning the church, are appended below.